There are a lot of things on your screen that distract you: crazy amount of icons, dock with dozens of notifications and an ocean of inactive apps. Information noise is annoying and interrupts work. Only one click and UnDistracted app turns off everything unnecessary and helps you to focus on the most important things. 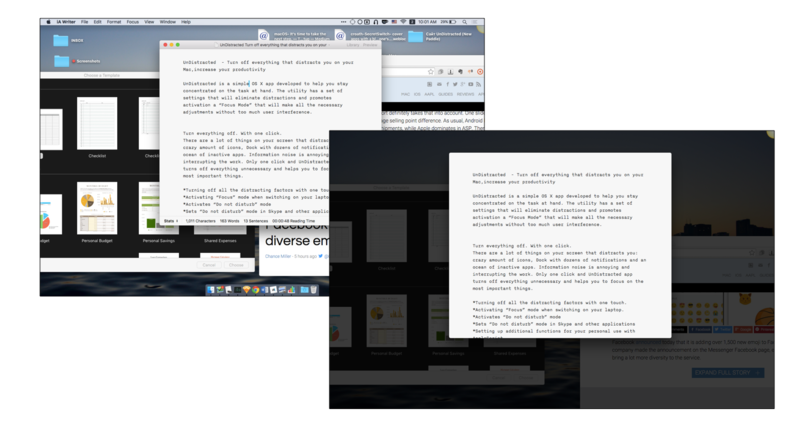 UnDistracted gives you the tools you need to make your desktop less distracting, so you can focus on the task at hand. 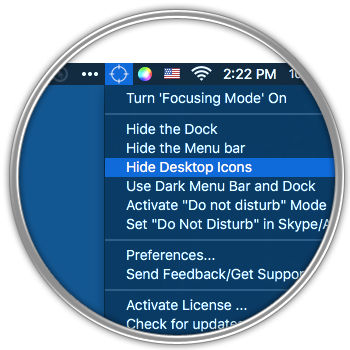 Unlike other applications (HazeOver, StayFocused, Shade) that perform only one task (shade windows, hide icons on the desktop), UnDistracted removes all distracting factors “with one click”. UnDistracted is an awesome little Mac utility that helps you get productive and focus by allowing you to zero-in on tasks and applications that you need to complete. UnDistracted can shadow all windows except the active one. Highlights the current working window and dims all the others in the background. Do you work with dozens of tabs open? Are there too many of them to concentrate? UnDistracted can shadow all windows except the active one. Fine tuning allows you to choose the shadow level. Now, only the essential things stay right in front of your eyes. Nothing interferes with you anymore. 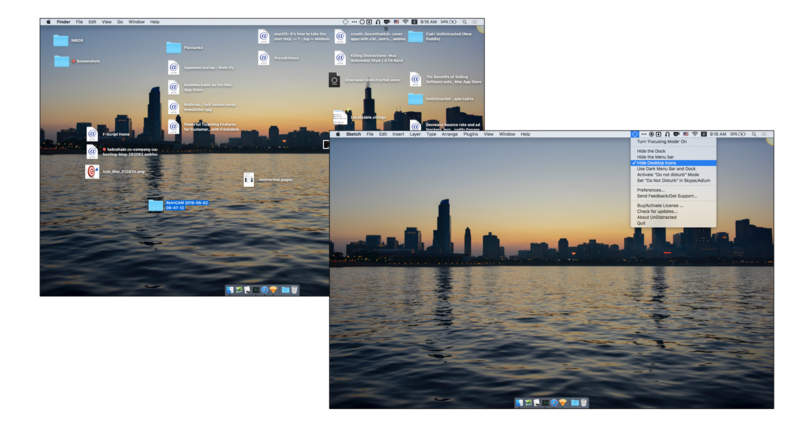 Desktop icon clutter can really impact workflow by overwhelming you with files and just too much stuff to look at. 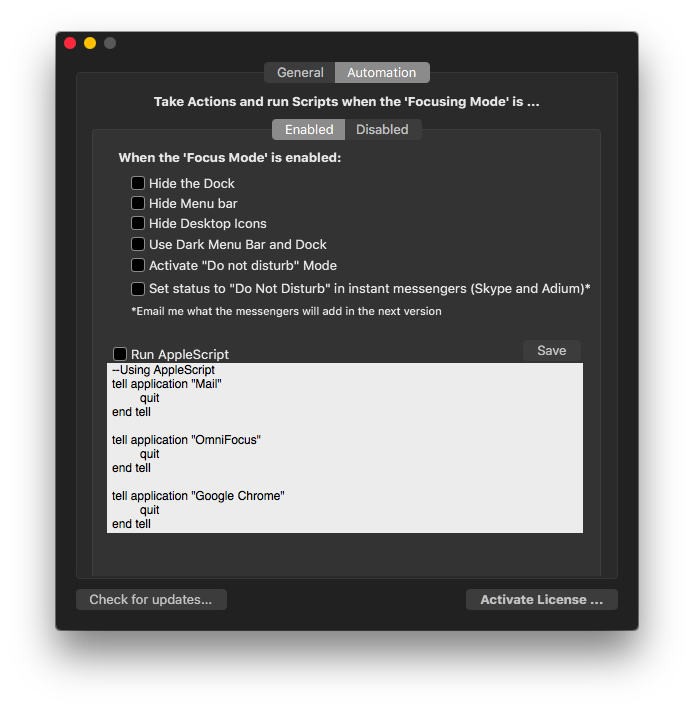 Activates the Dark theme for Dock and Menu, or Turns off Dock and Menu bar. 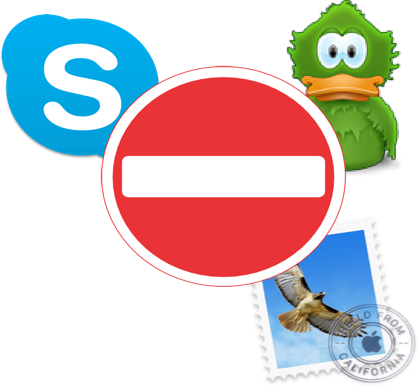 Sets messengers into “do not disturb” mode, removes all unwanted items from the screen and tries to eliminate all other distracting factors in one click, thus helping to focus and work efficiently. Via the UnDistracted status bar menulet, you can choose to hide the Dock, the menu bar and the desktop icons, switch to the dark menu bar and dock. 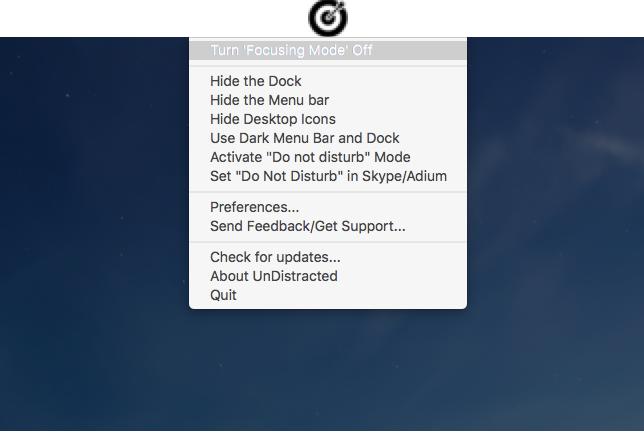 The same menu enables you to toggle the activation of the “Focus Mode” that will dim out all the inactive app windows present on your Mac’s desktop. As a result, you will be able to focus on the task at hand, without being distracted by various bits of incoming information. 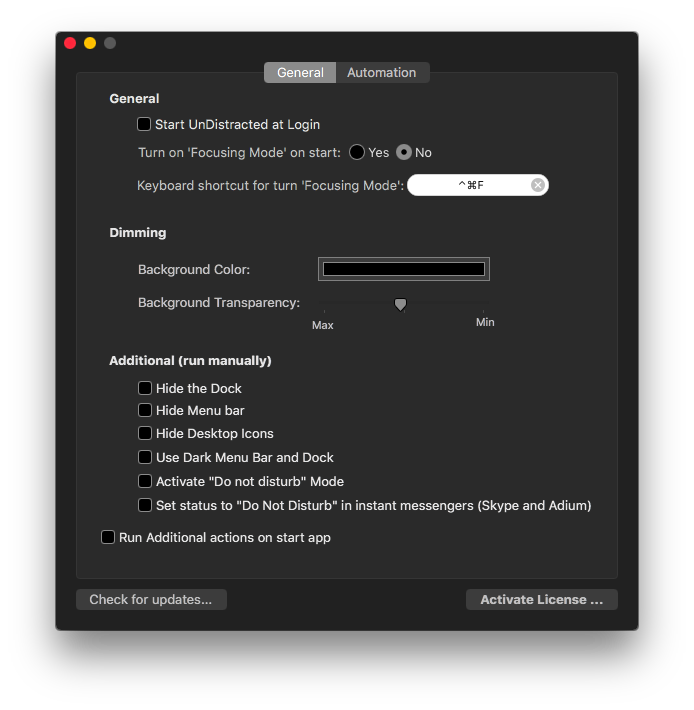 Via the UnDistracted preferences you have the option to change the dimming background color and opacity level, to set the functions that you want to be enabled by default at startup, and personalize the system-wide hotkey for activating the Focus mode. At the same time, UnDistracted can either enable or disable certain settings, depending on the activation state of the Focus mode. The unique feature of UnDistracted is its ability to launch and close applications, turn system functions on/off, change system parameters and basically change everything that is available on macOS with AppleScript, bash and with the modification of system settings.